I got invited to review a manuscript by a British Ecological Society journal (MEE) that is published with Wiley recently. I rejected the request and will from now on decline to review for all Wiley journals. In this post I duplicate my email to the Assistant Editor (Chris Greaves) explaining why. FWIW Chris has handled my letter extremely well and will forward it on for me to where it needs to be seen/read within the British Ecological Society. Thank you (and Rich FitzJohn) for inviting me to review this manuscript. It looks interesting from the abstract and in other circumstances I would certainly agree to review it. However, I refused to review this manuscript and will refuse to review any subsequent manuscript for this publisher (Wiley) because I believe they are actively impeding progress in science by choosing to operate a predominately subscription-based business model – artificially restricting access to knowledge that taxpayers (through government funding) and charities predominantly fund. Furthermore they do an extremely poor job of it. They produce but actively withhold full text XML (even from subscribers). Reputable open access publishers have no qualms in making their full text XML available to all. This is deeply frustrating for those interested in synthesis, reproducibility and getting the most from published science in a time-efficient manner. As the manuscript I was just asked to review was principally about ‘automated content analysis’ I find this particularly galling and I am wondering why the authors thought it was appropriate to submit this to such a journal. They use an outdated back-end system: ‘ManuscriptCentral’ which is by all accounts an extremely poor system. Wiley have made huge profits each and every year in the past decade and yet seem completely unwilling to re-invest that in improving their systems. There wasn’t even a free text box to explain my reasons for declining to review this manuscript. Utterly poor, neglected design. Try PeerJ or Pensoft’s submission system. They have clearly worked hard and invested time and effort into making publishing research better for everyone, not just their own profit-margin. Wiley are a significant player in the modern oligopoly of academic publisher knowledge racketeering. Data from FOI requests in the UK show that in the last five years (2010-2014), 125 UK Higher Education Institutes have collectively spent nearly £77,000,000 renting access to knowledge that Wiley has captured. That’s just the UK. Wiley doesn’t pay authors for their content, nor do they pay reviewers. I don’t know why the British Ecological Society (BES) partners with these racketeers – I find this arrangement severely detrimental to the goals of BES and academic research. Like the other big knowledge racketeers Wiley operate a ‘big bundle’ subscription system. By adding BES journals to this big bundle of subscriber-only knowledge, it makes it harder for libraries around the world to cancel their subscriptions to this big bundle. Wiley know this and hence are actively trying to acquire as many good journals as possible (e.g. ESA journals) to make themselves ‘too big to cancel’. On a personal note, I am particularly aggrieved with Wiley because they are currently, without my consent, charging $45.60 including tax, to ‘non-subscribers’ for access to one of my open access articles that they have copied over from where it is freely available at the original publisher. Charging $45.60 to access something that is freely available at the original publisher is simply astonishing and is just another facet to the lunacy of the many and multiple ways in which Wiley and companies like it seek to profiteer from and restrict access to research. For all these reasons and many more I simply cannot agree to review manuscripts for any Wiley journal. I am already boycotting Elsevier, and am considering applying the same to subscription-access Nature Springer and Taylor & Francis journals for similar reasons. I urge the British Ecological Society to reconsider their ‘partnership’ with this profiteering entity and to pursue publishing with organisations that are actually competent at modern 21st century academic publishing, particularly those that support and actively facilitate content mining e.g. Pensoft, PLOS, PeerJ, eLife, Ubiquity Press, MDPI and F1000Research, to name but a few. I feel relieved to have done this. Having reviewed for Wiley only last month it didn’t feel right. Why would I help them whilst boycotting Elsevier? They are essentially as bad as each other. My position is more logically consistent now. Mike Taylor: Researchers! Stop doing free work for non-open journals! PS Having read Tom Pollard’s post on this matter, I might also write to one of the authors to explain why I declined to review their article. I wish them them well and I look forward to reading their article when it comes out. ESA journals move to new publishing partner, John Wiley & Sons. Tough decision, tho. Ecotrack will fade away & I can't say I will miss it. Whilst I think the decision to move away from their old, unloved publishing platform is a good one. The move to publish their journals with Wiley is a strategically poor one. In this post I shall explain my reasoning and some of the widespread dissatisfaction with the direction of this change. Reading those four bullet points, it strikes me that a society with this stated mission should be a vanguard of the open access movement. An efficient, well-implemented open access publishing system, supported (and thus empowered) by the ESA would positively address all four of those goals. Universities around the world do not have access to all subscription journals, not even Harvard. Wiley’s big journal bundle of subscriptions is no exception to this rule. Brock University in Canada is one such notable example. ‘Ecology and Evolution’ is one of two “main themes” of Brock’s Biology Department yet it does not have access to the Wiley bundle of subscription journals. The level of access to journals was far lower than I had expected (it was actually shocking) – I ended up using my academic access throughout my placement. If the ESA seriously wants to “ensure the appropriate use of ecological science in environmental decision making by enhancing communication between the ecological community and policy-makers” then making it easier for policymakers like those at POST to access research published in ESA journals would surely be a great way of doing that. How does the ESA expect to “raise the public’s level of awareness of the importance of ecological science” if most of the science that they themselves publish in their own journals is behind an expensive paywall? $20 for 30 day access to one article? Admittedly that’s cheaper than many but it’s simply not supportive of ESA’s mission. Does this unnecessary paywall help raise the awareness of ecological science? Lastly, with respect to increasing “resources available for the conduct of ecological science” the ESA urgently needs to consider the big picture here. Wiley, Springer Nature, Elsevier and other legacy publishers are a major drain on the financial resources available for research. With their big bundle deals they ransom/rent access to libraries for sums that can be up to many millions of dollars, every year, per institution. Money should instead be diverted into efficient, high-quality publishing systems like JMLR, Open Library of Humanities, PeerJ, Pensoft and Ubiquity Press to name but a few. All of these not only provide open access, but also high-quality publishing services at a significantly lower cost. Many provide added extras such as semantically-enhanced full-text XML which would make synthesis of ecological science easier. Wiley does not provide direct access to per article full-text XML even to its paying subscribers! They do half the job for thrice the price. Why would ESA want to help to sustain and enhance Wiley’s famous 42% profit margin? These legacy publishers are strategically merging, and acquiring journals in order to make it harder for libraries to cancel their dross-laden ‘big bundle’ subscription packages. It doesn’t seem like a logical decision to me or others. In 2014 all of their journals moved away from being published with Wiley. Their two zoological journals which have been around since before the ESA was even formed(!) transferred to open access publishing with Pensoft. Their Earth Science journal Fossil Record also moved away from Wiley, to open access publishing with Copernicus Publications. Guess what? The sky didn’t fall. I predict the articles in these journals will start being read, downloaded and cited more now that they are open access to everyone. In 2015 PalSoc journals switched to be published with Cambridge University Press (CUP). I’m not super enthusiastic about CUP but if a society really wants to do legacy publishing, without worsening the stranglehold of the big publishing companies over libraries then CUP, or other university presses (Oxford, John Hopkins, Chicago) seem like safer custodians of academic intellectual property to me. To provide a fair comparison it’s important to look at what happens when a society journal joins Wiley. I know of one such case recently: ASLO journals. The transfer to Wiley was far from smooth or professional. In the few months that Wiley had the ASLO journals, they managed to ‘accidentally’ paywall thousands of articles that should have been available for free (as per ASLO’s wishes) and charged actual readers for reading these older should-be-free articles. I paid $45.60 for access to one such ASLO article at Wiley – it should have been made available to all for free. Both Springer and Elsevier have also been caught doing this. The ESA currently makes some articles in its subscription journals ‘free to read’ to all, so I shall be closely monitoring the new Wiley-ESA journal websites when they launch, to see if they make the same conveniently profit-generating ‘mistakes’ again. How did this happen? Who was consulted? Why was this choice made? I for one was completely unaware that ESA were looking for a new publisher. I would have tried to help if I had known. I have many unanswered questions over the consultation process. For example, the ESA has an Open Science section and mailing list, its members are extremely knowledgeable about the academic publishing landscape and publishing technology. Was the ESA membership in it’s entirety specifically and clearly asked which publisher they would like the ESA to publish with? Did they ask their membership what features they wanted from their new publishing platform? I would have requested a platform that provides access to semantically-enriched full text XML – Wiley does not provide this. Given a choice, and the vital context and information given above I think few ESA members, policymakers, or members of the public would choose Wiley as ESA’s new publisher. I gather from Twitter that “any and all” were invited to submit a proposal to publish ESA journals and that Elsevier submitted a proposal. But having a lazy tendering process only biases decisions towards major conglomerates who have the time, energy and resources to make slick proposals – I wonder if smaller but high-quality publishing companies were pro-actively approached by ESA to submit a proposal? In the public interest, I think the ESA should publish the names of all organisations who submitted proposals to publish ESA journals – I think just that data alone might potentially reveal flaws in the tendering process. I’m finding it really hard to reconcile the goals of ESA and shareholder-profits motivation of Wiley. I genuinely think the leadership of ESA is out of touch with its membership and that they may not have been properly consulted about this major change to the society. I don’t know if Wiley is the worst offender amongst the large commercial publishers, or whether there is a real trend toward cancelling Wiley packages. But I know the future of scholarship lies elsewhere than with these large legacy corporations. But perhaps we can turn this negative into positive by creating resources and impartial educational guides for academic societies on how to negotiate better publishing deals, and how to start a tendering process with an eye towards the inevitable future of open access? If SPARC or SPARC Europe already provides these resources please do point me at them! That there are no sign-ins, registrations, DRM viewing issues, or other ‘free” obstacles to viewing the article. Comment: Quite rightly, April does not trust the publisher to make the published work fully open access in perpetuity, and wants to do more as an author, with the publishing agreement (a formal contract) to ensure that the publisher will actually provide the exact services she wants. Recent events this year, whereby Elsevier, Wiley and Springer have all been caught red-handed selling access to hybrid open access articles justifies this lack of trust. It’s a sad state of affairs that authors such as April & myself no longer trust some service providers to actually provide the services we pay them for (e.g. Open Access). Some helpful links & pointers have been provided on the discussion list, and this may be a concern many other scholarly authors have so it’s valuable to collate, discuss and publicise possible solutions to the thorny problem of publishing agreements with legacy publishers. I certainly don’t pretend to have all the answers here and I think organisations like SPARC might want to act on this one. Lorraine Chuen links to the Canadian Association of Research Libraries (CARL) ‘Resources for Authors’ page which amongst other things discusses the Canadian SPARC Author Addendum. I knew about the US SPARC Author Addendum, but I never knew there was a Canadian version too! Matt Menzenski links to the University of Kansas Authors & Copyright page. I particularly like An Introduction to Publication Agreements for Authors (Armstrong, 2009) that they link to at the very top – it’s really useful information. If they send you a standard CTA (Copyright Transfer Agreement) form as PDF, you can modify the wording of that PDF to terms you prefer and send it back to them and they probably won’t even notice as long as it’s signed & doesn’t look too different. It’s cheeky, but I got away with it for a book chapter once. Be careful to remove / replace the term ‘work for hire’ – it may look like an innocuous statement but apparently this is fairly key in legal terms – I neglected to remove that from my book chapter agreement. Not as easy perhaps for multi-author papers but Mike Taylor has a good (successful-ish) anecdote about transferring his copyright to his spouse, thereby preventing the Geological Society from taking the copyright of the work. Use Section 105 of the US Copyright Act by pretending that at least one of the authors is an employee of the US Government. Works of the U.S. federal government cannot be copyrighted by their authors in the US – they must be public domain, which is in practice achieved by applying the Creative Commons Zero waiver to the paper. The CTA form may contain a check box asking about this. If not, just email them about it. Michael Eisen famously, successfully liberated a NASA space research paper from behind a paywall at Science (AAAS), using Section 105 as justification. Will publishers really bother fact-checking your assertion about the employment of one of the authors? I don’t think so. It could land them in big trouble if they dare disregard the US Copyright Act. Another risky approach is simply not to sign or not to return the CTA the publisher sends you after acceptance (with the obvious risk that this could delay publication). I think this is perhaps the most promising approach, there is strong evidence that many academics currently employ this practice. When you think about it: publishers actually need our papers or they’ll go bust. They need a constant stream of content to justify their existence. If you don’t sign-off on their stipulated terms and conditions, after acceptance, they do have real pressures to get on and publish the paper anyway, especially with the increased focus on optimising submission to publication times these days. A number of tweets posted by Prof. Luis Apiolaza on 27 April, and by others active on social media, suggest that Springer is charging for access to open access articles published in Annals of Forest Science. After looking into this issue, there is indeed an issue with the status of the article, but this has to do with the background of the journal itself. Annals of Forest Science is a journal owned by INRA (Institut National de la Recherche Agronomique). In 2009, when the article in question first appeared, the journal was being published by another company that allowed readers to read the articles without paying a fee (“free access”). When Springer started working with INRA in 2011 we agreed to add the 2007-2010 archives to SpringerLink, Springer’s online platform, in order to ensure a smooth transition and to give a wider distribution to the most recent articles. Since the copyright was not assigned to the author, and since there is no mention of the licensing used, we incorrectly assumed that the article was not open access. It is clear that this article was intended to be open access, and it will be made so on SpringerLink as quickly as possible. Anyone that has purchased the article will, of course, be reimbursed. Please note that we support Green Open Access and we feed all articles from INRA journals to the HAL repository after the 12-month embargo, making the articles freely downloadable there (this is clearly written on the journal’s webpage, with a link to the HAL platform). The article in question can also be found there for free (since 2011). This has been an oversight, and we apologize for not being more thorough and vigilant. I am pleased that Springer are committing to reimbursing all (reader) purchasers of wrongly-paywalled articles, and I shall check my bank balance regularly in the coming weeks to see if they honour this promise. I am also pleased that Springer see fit to formally apologize for their carelessness of publishing. I note that AFAIK neither Wiley nor Elsevier have apologised for similar incidents this year. Indeed it seems they chose this wording carefully, because as far as I can tell with my browser, Luis’s open access article is still on sale (see screenshot below). Update: As of 2015-07-05 13:20 (BST) the article is now no longer paywalled. At the time of writing, as can be seen below it was clearly paywalled. Springer SBM as an entity makes nearly a billion euros per year in turnover. 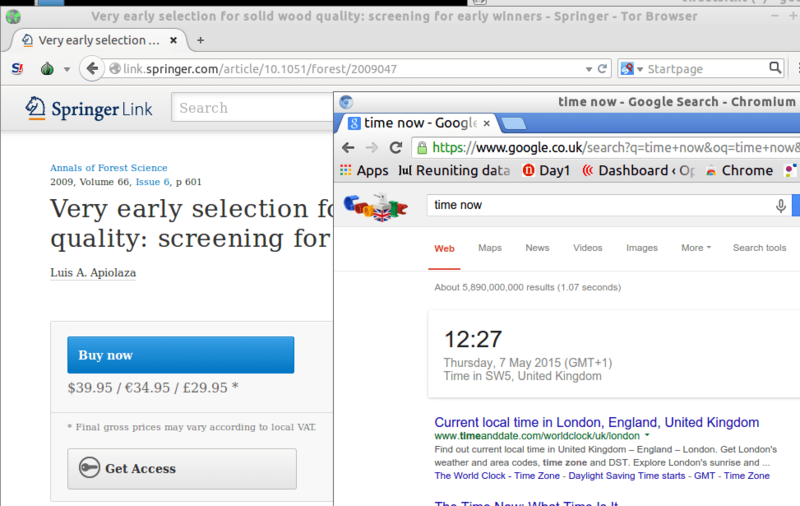 Despite the considerable size, wealth and ‘experience’ in publishing, Springer can’t seem to unpaywall Luis’s article. Astonishing.